These marvellous Mary Poppins Returns filming locations brings her magic out of the Disney studio and into London. For the first time, everyone’s favourite nanny leads us through real cobbled streets around Covent Garden, past Buckingham Palace and beyond. And of course, we can make a few detours to find PL Travers’ inspiration too. Mary Poppins Returns was filmed in picture-postcard London locations, from the East End to the heart of Westminster. A few locations are so impressive that it’s hard to believe they weren’t added in post-production. Vintage vehicles from the London Bus Museum were rolled out onto the capital’s streets, complete with 1930s-style posters. It all marks a shift away from the first Mary Poppins movie, which was filmed entirely at Disney’s Burbank studios. In fact, Cherry Tree Lane consumed all of Studio 2, which was later renamed the Julie Andrews Stage in honour of the Mary Poppins star. And while the Mary Poppins Returns team shot the likes of Cherry Tree Lane, the Royal Doulton Music Hall and Big Ben (or Elizabeth Tower if we’re being pedantic) at Shepperton Studios, most of the backlot scenes are framed by real London locations. Jack is seen cycling along Chandos Place in Covent Garden. It’s easy to stroll along if you’re in the area – it’s just a couple of streets away from Covent Garden Market, Charing Cross and Leicester Square. Two major landmarks appear too. Jack is seen cycling past St Paul’s Cathedral and the Tower of London in the opening scene. Again, you can easily follow Jack’s trail across London for free. 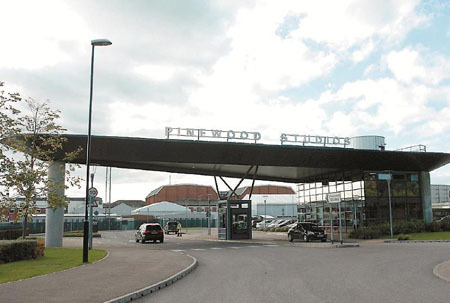 But if you want to peek inside for an admission fee, they’re each well worth seeing for their own history and their movie appearances. The Tower of London was used in Muppets Most Wanted among other things. St Paul’s is a particularly hot location – the cathedral was recently seen in Paddington 2 and Fantastic Beasts: The Crimes of Grindelwald, and the streets around it can be seen in Christopher Robin. We don’t typically feature sound stages, but you might be interested in where the iconic Cherry Tree Lane scenes were filmed. The story behind the real Cherry Tree Lane in London could come straight from a book too. 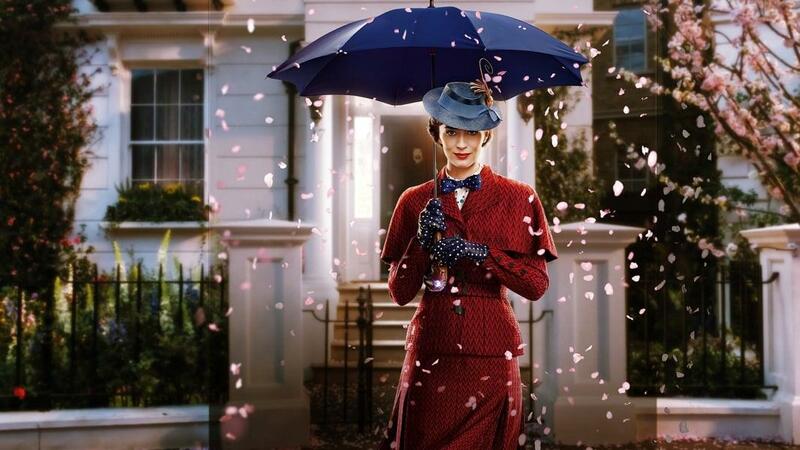 Mary Poppins Returns’ Cherry Tree Lane scenes were shot on Shepperton’s H Stage, including street scenes, exterior shots and interior shots of the Banks family home at 17 Cherry Tree Lane. The original movie used a set, so it’s a logical way to recreate the street we all know so well. But the Banks family aren’t the only residents on the street, and the strongest link between this quirky fictional neighbourhood and reality isn’t found at No. 17. It’s the family’s neighbour, Admiral Boom, who makes the connection. Admiral’s Walk in Hampstead is said to have inspired the unstoppable Admiral Boom and his hourly cannon fire. Fountain North, an early 19th Century resident, was a seafarer who added an extension to his hundred-year-old home, making it resemble a ship. Bizarrely, another local added an even more unlikely element of truth to the Mary Poppins character. Like Admiral Boom, the real Admiral Matthew Barton would fire a cannon to celebrate various occasions (though not every hour, on the hour). PL Travers lived in the area, though her Blue Plaque can be found in Chelsea, where she lived in the post-War years. Exterior shots of Cousin Topsy’s house appear to have been shot in Goodwin’s Court, an easily-missed back street in the heart of Covent Garden. In the film, this realistic Mary Poppins Returns filming location is seen when Mary Poppins, Jack and the Banks children walk down the lane to ask for help repairing the broken bowl. They knock on a door and Cousin Topsy emerges, in the form of Meryl Streep. In other words, a set so fantastical it could only be built on a sound stage. But it’s made even more magical by that real world location at the start of the scene, which makes you feel like you might just stumble across that upside-down house. Two appropriately financial building were used as Mary Poppins Returns’ Fidelity Fiduciary Bank filming locations. Michael has grudgingly followed his father’s example by taking part-time work at the bank, but Royal Exchange – the City of London’s first stock exchange – and the Bank of England. If you want to take a closer look at Michael Banks’ line of work, the bank itself can be found on Threadneedle Street. But head to the Bartholomew Lane entrance and you can actually step inside, to explore the institution’s history and the secrets of its vaults. A London Bus Museum vehicle is seen outside. in the City of London are used as Mary Poppins Returns bank filming locations. The museum houses the world’s largest collection of London Buses, so of course they had just the right vintage transport ready and waiting. Keeping the roads clear in one of London’s busiest areas was a far bigger challenge during the March 2017 shoot. Hundreds of extras feature in the scene, with Mary Poppins, Michael Banks and the children passing through the crowds and into the bank. Look out for the Buckingham Palace filming location – it really is the Queen’s London residence. This is just one of many scenes where the team got out and about in London, but it’s unexpectedly high profile. Emily Blunt and Lin-Manuel Miranda were spotted during filming, and because the film uses so many traditional practical effects in place of CGI, some fun details were captured on camera. Photographers caught flying bicycles and in action, in the midst of an artificial ‘pea-souper’ fog, making this magical scene all the more delightful. As you might have guessed, the Mary Poppins Returns Regents Park location was just used for exterior shots. The most magical details are actually a set – like the park scenes in the original Mary Poppins film. Onscreen, we find this fictional corner of Regent’s Park through a series of cobbled lanes. 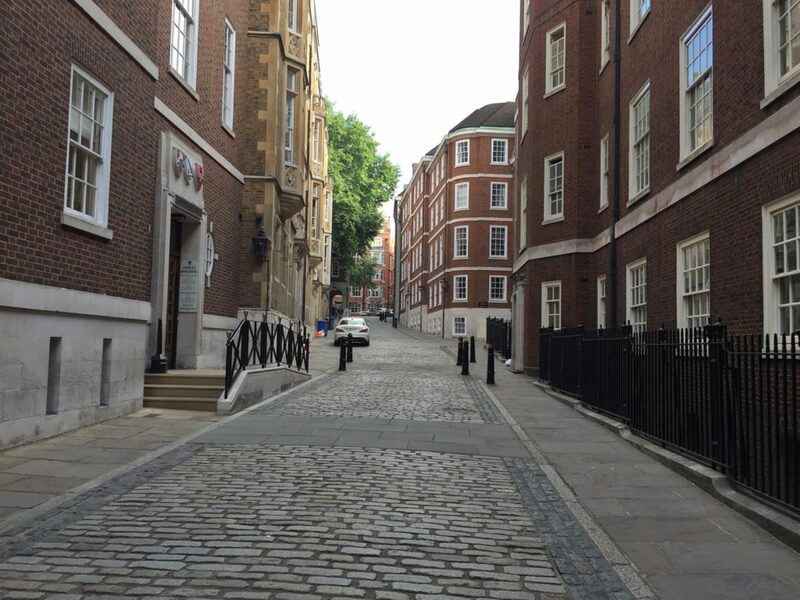 These little alleys and tunnels belong to Middle Temple, a historic legal institution near the Strand. You might recognise some of the old brickwork from another recent Disney film with a historical setting, Christopher Robin. And once we go inside, we’re thrown into a glowing five storey set that took 26 weeks to build. For comparison, Cherry Tree Lane ‘only’ took two-thirds of that time to construct. But you can experience a little bit of the Banks family’s life for yourself, in the real Regent’s Park. Cherry trees line a strip of Avenue Gardens, leading you past a series of secret gardens and fountains. Beyond the treeline, you can spot rows of stucco townhouses which would fit right in on Cherry Tree Lane. If you keep walking, you’ll end up in another Mary Poppins adventure. The path eventually leads to ZSL London Zoo, home to a cute penguin colony and other animals (though we confess, the penguins don’t serve in the café).